The TASTIEST baked chicken parmesan recipe that is easy to prep on a weeknight! Crispy, cheesy, but lighter. 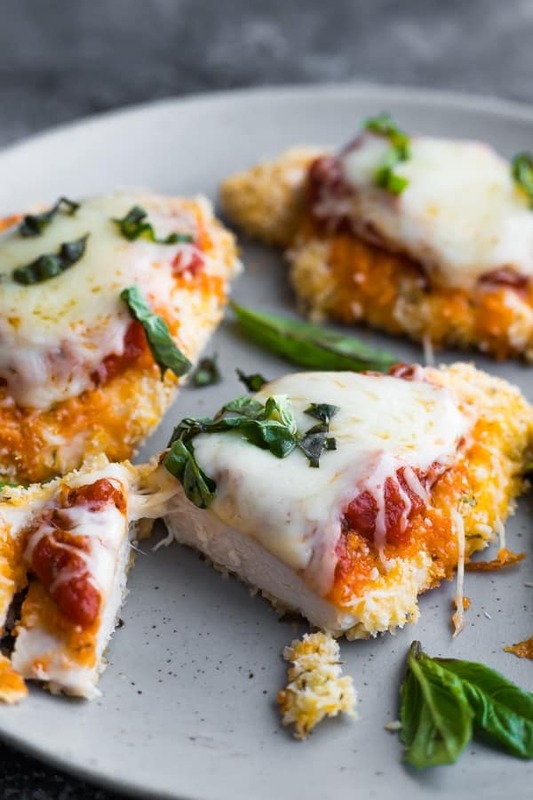 Say hello to your new favorite weeknight dinner: this baked chicken parmesan recipe! 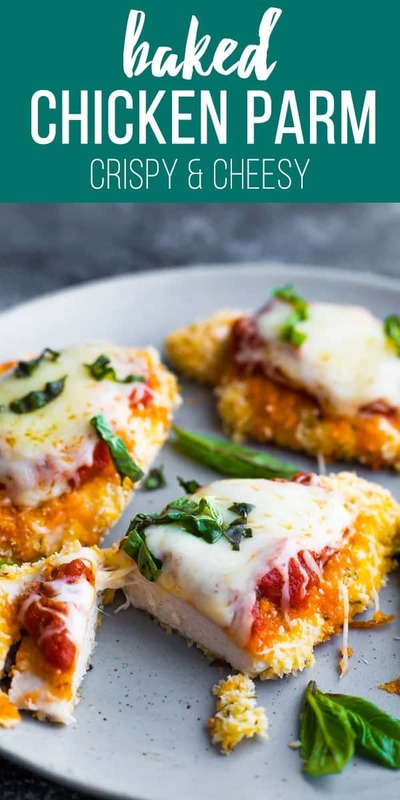 With crispy panko breadcrumbs and a healthy dose of cheese, this chicken parm recipe is loved by kids and grown ups alike! Certain recipes have always been ‘off limits’ to me because they are too complicated to prep. Take chicken parmesan for example. Classic chicken parmesan is dredged, fried, then baked in a homemade tomato sauce. That is WAY too many steps for me to undertake on a busy weeknight. Especially if I have a toddler clinging to my ankle. 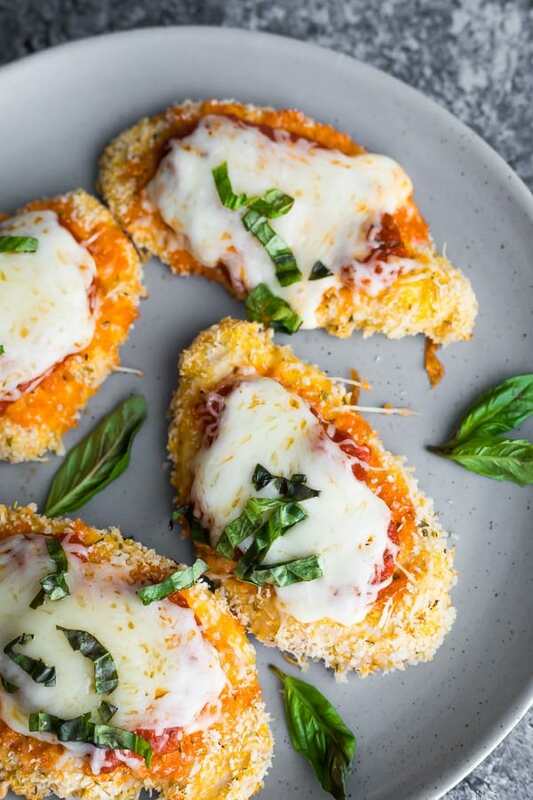 Today’s baked chicken parmesan recipe has a few shortcuts that not only make it healthier, but easier to prepare as well! Please note that this chicken parmesan recipe is by no means authentic, but this is my simplified (and healthified) version that will fit much better into a busy and healthy lifestyle! 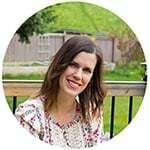 Can I make this healthy chicken parmesan gluten-free? I haven’t tried this but I think you could swap the all purpose flour for gluten-free or almond flour, and the panko for gluten-free panko without any problems. Can I lower the carbs in this healthy chicken parmesan? 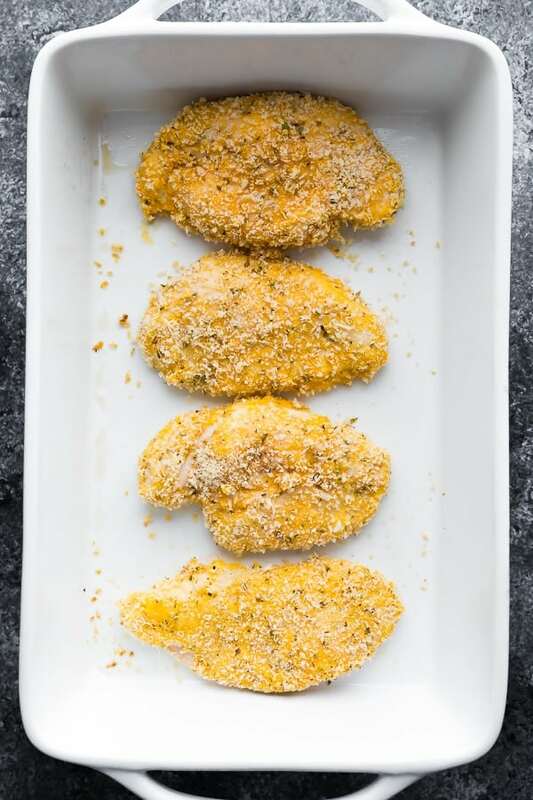 I would check out this recipe for Low Carb Chicken Parmesan which uses pork rinds in place of breadcrumbs! 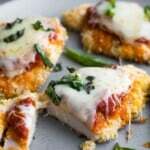 Can I make this healthy chicken parmesan recipe ahead of time? I haven’t tried but here’s how I’d do it: Bake the chicken for the 20 minute step, then cool completely and store without the marinara and cheese. Re-heat on a baking sheet for 5 minutes at 350°F, then add the marinara and cheese and bake for another 5 or so minutes until the cheese is melted. What can I serve with this chicken parm recipe? I have lots of ideas for ya! Looking for more chicken recipes? Try my Perfect Baked Chicken Breasts and Perfect Baked Chicken Thighs, or check out this post with 7 Chicken Marinade Recipes You Can Freeze! 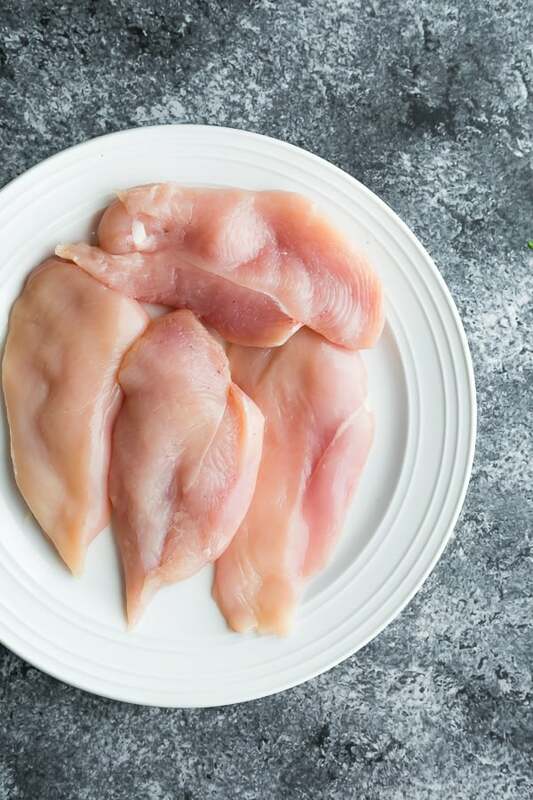 Cut chicken breasts horizontally so you end up with flat, wide pieces. 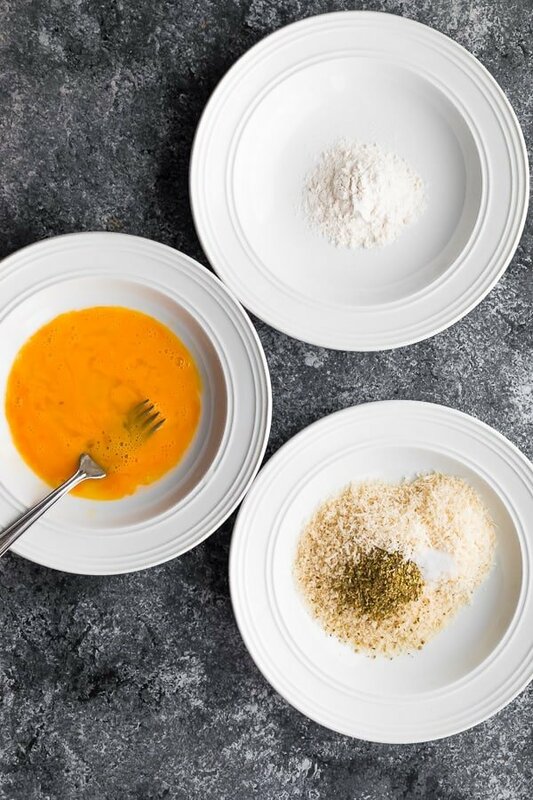 Into three separate bowls add: 1. flour 2. egg 3. panko, parmesan cheese, oregano and salt. Using tongs, dredge the chicken in the flour mixtue until coated. Shake off excess. Dip chicken in egg mixture until thoroughly coated. Finally, coat the chicken on both sides in the panko/parmesan cheese mixture. Place each coated chicken breast on a baking sheet, then bake in the pre-heated oven for 20 minutes. Top with marinara, then mozzarella cheese and return to the oven for another 5 minutes, or until cheese has melted.